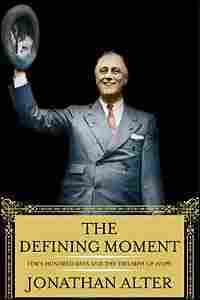 Author Reconstructs FDR's 'Defining Moment' Franklin Delano Roosevelt held the office of president during one of the most trying economic times in U.S. history, The Great Depression. In his new biography, The Defining Moment, Jonathan Alter goes behind FDR's handling of the crisis. Franklin Delano Roosevelt held the office of president during one of the most trying economic times in U.S. history, The Great Depression. In his new biography, The Defining Moment, Jonathan Alter goes behind FDR's handling of the crisis. One new find revealed in Alter's book is a draft of a radio speech Roosevelt planned to give on his first day in office, one that included a bold assertion of authority to draft a private army from members of the American Legion. The draft was discarded, and Roosevelt moved away from the "dictator" style of leadership that some felt was needed. Read on for more about the speech, and FDR's first day in office. On this, his first full day in the presidency, Franklin Delano Roosevelt awoke in a creaky narrow bed in the small bedroom of the White House family quarters he had chosen for himself. After his valet, Irvin McDuffie, helped him with the laborious task of putting on his iron leg braces and trousers, McDuffie lifted him into his armless wooden wheelchair for the elevator ride downstairs. The new president's schedule called for him to attend morning services at St. Thomas's Church with his family, host a luncheon for twenty at the White House, and then chair an emergency Cabinet meeting, where he would outline his plans to call Congress into emergency session. None of the staff or reporters who saw him that Sunday noticed that FDR was anything other than his usual convivial self. He had stayed up past one o'clock the previous night talking with Louis Howe, his longtime chief aide and campaign strategist, while Eleanor and their five children attended the Inaugural Ball without him. The crippled president, now fifty-one years old, hadn't wanted to sit passively while everyone else danced; passive was not his style. Besides, he and Howe had important things to discuss, beginning with how to extricate the United States from its gravest crisis since the Civil War. The American economic system had gone into a state of shock, its vital organs shutting down as the weekend began. On Friday, the New York Stock Exchange suspended trading indefinitely and the Chicago Board of Trade bolted its doors for the first time since its founding in 1848. The terrifying "runs" that began the year before on more than five thousand failing banks had stripped rural areas of capital and now threatened to overwhelm American cities. At dawn on Saturday, only a few hours before FDR's swearing in, the governors of New York, Illinois, and Pennsylvania signed orders closing the banks in those states indefinitely, which meant that thirty-four out of forty-eight American states, including the largest ones, now had no economic pulse. Each state's closure had its own financial logic, but collectively they proved merciful. Without them, Saturday morning would have brought even more ruinous bank runs, with legions of depositors descending on their banks in desperation at the very moment the new president took the oath of office. The outgoing president, Herbert Hoover, was on his way back to California, a study in failure. As late as 1:00 a.m. on Inauguration Day, he was still haggling with FDR on the telephone about the banking crisis. In late morning, they rode in uncomfortable silence to the Capitol. Hoover's brilliant understanding of complex issues had brought him and the country nothing. 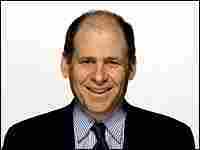 For more than three years, since the aftermath of the stock market crash, he had been sullen and defensive as disease spread through the American economy. As frightening as life had become since the Great Depression began, this was the bottom, though no one knew that at the time. The official national unemployment rate stood at 25 percent, but that figure was widely considered to be low. Among non-farm workers, unemployment was more than 37 percent, and in some areas, like Toledo, Ohio, it reached 80 percent. Business investment was down 90 percent from 1929. Per capita real income was lower than three decades earlier, at the turn of the century. If you were unfortunate enough to have put your money in a bank that went bust, you were wiped out. With no idea whether any banks would reopen, millions of people hid their few remaining assets under their mattresses, where no one could steal them at night without a fight. The savings that many Americans had spent a lifetime accumulating were severely depleted or gone, along with 16 million of their jobs. When would they come back? Maybe never. The great British economist John Maynard Keynes was asked by a reporter the previous summer if there were any precedent for what had happened to the world's economy. He replied yes, it lasted four hundred years and was called the Dark Ages. Late in 1933, the journalist Earle Looker peered backwards several months to assess the Hobbesian stakes as FDR assumed office: "Capitalism itself was at the point of dissolution. Would men continue to work for profit as our forefathers understood it and as our people now understand it? This was a real question, for money was now useless. Would it be necessary soon to organize our families against the world, to fight, physically, for food, to keep shelter, to hold possessions?" Even two generations later, the terror remained indelible for those who experienced it. "It was just as traumatic as Pearl Harbor or the destruction of the Twin Towers," the scholar Richard E. Neustadt, who was a teenager at the time, recalled. "It wasn't on television, but the banks were failing everywhere, so you didn't need television to see what was going on." Roosevelt's Inaugural Address had begun the process of restoring hope, but not everyone caught the new mood right away. The press coverage that morning largely downplayed or ignored FDR's line: "the only thing we have to fear is fear itself." The New York Times and most other newspapers relegated the line to their inside pages, while focusing instead on the vivid wartime allusions he employed five times during his speech -- martial metaphors that suggested that there was, in fact, plenty to fear after all. The greatest applause from the large crowd on the east side of the Capitol came when Roosevelt said that if his rescue program was not quickly approved: "I shall ask Congress for the one remaining instrument to meet the crisis: broad executive power to wage war against the emergency, as great as the power that would be given to me if we were in fact invaded by a foreign foe." The United States had not been "invaded by a foreign foe" since 1812, but this felt like it. Arthur Krock of the Times compared the mood in Washington on Inauguration Day to "a beleaguered capital in wartime." For the first time since the Civil War, armed men patrolled the entrances to federal buildings, while machine gunners perched on rooftops. Editors knew that the world war, just thirteen years in the past, had concentrated great power in the hands of Woodrow Wilson's government. To them it looked as if FDR were proposing the same thing. And so the approving headline FOR DICTATORSHIP IF NECESSARY ran in the New York Herald-Tribune on March 5, with similar notes stuck in the Inauguration coverage of other major papers. Exactly what was "necessary"? No one knew, including Roosevelt. Even before being sworn in, he had decided on a federal bank "holiday" (a festive term he preferred to Herbert Hoover's "moratorium") to give the people who now ran the country a few days to figure out what to do. Then what? Should he assume wartime authority on a temporary basis? Call out the Army to protect banks and maintain order? Mobilize veterans? Unrest was already growing in the farm belt, where mobs had broken up bankruptcy auctions. Four thousand men had occupied the Nebraska statehouse and five thousand stormed Seattle's county building. The governor of North Carolina predicted a violent revolution, and police in Chicago clubbed teachers who had not been paid all school year. Everywhere, bank runs threatened to turn violent. By the Inaugural weekend, police in nearly every American city were preparing for an onslaught of angry depositors. At least some were certain to be armed. With so many banks involved, the U.S. Army -- including National Guard and Reserve units -- might not be large enough to respond. This raised the question of whether the new president should establish a makeshift force of veterans to enforce some kind of martial law. The temptation must have been strong. It hardly seems a coincidence that FDR decided that the first radio speech of his presidency would be specially addressed to a convention of the American Legion, the million-member veterans' organization co-founded after World War I by his fifth cousin, Theodore Roosevelt. As new commander-in-chief under the oath to which you are still bound I reserve to myself the right to command you in any phase of the situation which now confronts us. This was dictator talk -- an explicit power grab. The new president was contemplating his "right" to command World War I veterans -- mostly men in their late thirties -- who had long since reentered civilian life. It was true that they had sworn an oath to the United States on entering military service and that the 1919 founding document of the American Legion pledged members to help "maintain law and order" and show "devotion to mutual helpfulness." But the commander in chief had no power over them. Here Roosevelt would be poised to mobilize hundreds of thousands of unemployed and desperate men by decree, apparently to guard banks or put down rebellions or do anything else he wished during "any phase" of the crisis, with the insistence that they were dutybound to obey his concocted "command." That word -- "dictator" -- had been in the air for weeks, endorsed vaguely as a remedy for the Depression by establishment figures ranging from the owners of the New York Daily News, the nation's largest circulation newspaper, to Walter Lippmann, the eminent columnist who spoke for the American political elite. "The situation is critical, Franklin. You may have no alternative but to assume dictatorial powers," Lippmann had told FDR during a visit to Warm Springs on February 1, before the crisis escalated. Alfred E. Smith, the Democratic nominee for president in 1928, recalled with some exaggeration that "during the World War we wrapped the Constitution in a piece of paper, put it on the shelf and left it there until the war was over." The Depression, Smith concluded, was a similar "state of war." Even Eleanor Roosevelt, more liberal than her husband, privately suggested that a "benevolent dictator" might be what the country needed. The vague idea was not a police state but deference to a strong leader unfettered by Congress or the other inconveniences of democracy. Amid the crisis, the specifics didn't go beyond more faith in government by fiat. Within a few years, "dictator" would carry sinister tones, but -- hard as it is to believe now -- the word had a reassuring ring that season. So did "storm troopers," used by one admiring author to describe foot soldiers of the early New Deal, and "concentration camps," a generic term routinely applied to the work camps of the Civilian Conservation Corps that would be established by summer across the country. After all, the Italian Fascist Benito Mussolini, in power for a decade, had ginned up the Italian economy and was popular with everyone from Winston Churchill to Will Rogers to Lowell Thomas, America's most influential broadcaster. "If ever this country needed a Mussolini, it needs one now," said Senator David Reed of Pennsylvania, outgoing President Hoover's closest friend on Capitol Hill. The speech draft prepared for FDR brought to mind Mussolini addressing his black-shirt followers, many of whom were demobilized veterans who joined Il Duce's private army. Roosevelt came to office just as the appetite for strong leadership seemed to be surging worldwide. For Americans, German chancellor Adolf Hitler was worrying but new, his leadership to be ratified in a legal election held across Germany that very day, March 5. While Hitler was already seen in the United States as a reckless buffoon, almost no one in the country yet focused on the threat posed by fascism. The most powerful American publisher, William Randolph Hearst, seemed to favor dictatorship. The Hearst empire extended to Hollywood, where Hearst that winter had personally supervised the filming of an upcoming hit movie called Gabriel Over the White House that was meant to instruct FDR and prepare the public for a dictatorship. The movie's hero is a president played by Walter Huston who dissolves Congress, creates an army of the unemployed, and lines up his enemies before a firing squad. FDR not only saw an advance screening of the film, he offered ideas for script rewrites and wrote Hearst from the White House that he thought it would help the country. "There was a thunder in the air as when the Fascisti marched upon Rome," wrote one journalist close to the Roosevelt camp, of the fevered climate that chilly March weekend. "It was the same tension that quivered about the Kremlin at the beginning of the Five Year Plan. Insiders thought there was to be a peaceful revolution involving a dictatorship." FDR knew the consequences of failing to seize the day. A visitor -- unidentified in the press -- came to him not long after the Inauguration and told him, "Mr. President, if your program succeeds, you'll be the greatest president in American history. If it fails, you will be the worst one." "If it fails," the new president replied, "I'll be the last one." This sounds melodramatic to Americans in the 21st century, when freedom is flourishing in so many parts of the world. But during the 1930s, democracy was on the run, discredited even by subtle minds as a hopelessly cumbersome way to meet the challenges of the modern age. At the time, history offered little precedent for a leader taking power amidst a severe military or economic crisis without seizing more authority for himself. The few republics ever established -- from ancient times to modern Europe -- had eventually bent before such demands. So did the American system. During the Civil War, Abraham Lincoln suspended habeas corpus and twisted the Constitution in order to save the nation. But on March 5, 1933, an astonishing thing happened -- or more precisely, did not happen. The draft of that American Legion radio address was destined not for the ears of millions of veterans and other Americans, but for nothing more than the speech files of the Roosevelt Library, where it lay unexamined for more than seventy years. The five-minute speech that FDR delivered that night built on the military tone of the Inaugural. He argued for the "sacrifice and devotion" of wartime and noted that it was "a mistake to assume that the virtues of war differ essentially from the virtues of peace." But there was no hint of the need for a private army. No one knows who wrote the unused draft or why FDR discarded the suggested additions, but something inside the man kept him from moving in an extraconstitutional direction. Some combination of personal and democratic conviction set him on a different course, at once more traditional and bold. This most pragmatic of modern American presidents sensed the unworkable nature of untrammeled power, even in the hands of the only person he completely trusted -- himself. In the days ahead, FDR moved in the opposite direction, passing the word on Capitol Hill that he did not believe in a constitutional dictatorship and asking his friend Felix Frankfurter to tell Lippmann to stop hawking dictatorship and disrespect of Congress in his columns. It was not as if Roosevelt was letting the cup pass; for the next twelve years, he would fully exploit the authority of the presidency, sometimes overreaching to the point where his enemies accused him of becoming a dictator. He would flirt with fascistic (or at least corporatist) ideas like the National Recovery Administration and in 1937 try to pack the Supreme Court. But even then, he would do so in the context of democracy, without private armies or government-by-decree. Even at his worst, he would eventually submit his schemes for the approval of Congress. Instead of coercion, he chose persuasion; instead of drawing the sword, he would draw on his own character and political instincts. He would draw, too, on the subconscious metaphor of his own physical condition. Although it was only rarely mentioned in the press, the American people knew at the time that he had polio (though not the extent of his disability) and it bound them to him in ways that were no less powerful for being unspoken: If he could rise from his paralysis, then so could they. The deeper questions would take time to plumb. If character was to be FDR's weapon for confronting the crisis, how was it forged and then deployed? Which complex combination of temperament, background, and experience allowed Roosevelt to bring off his act in his famous Hundred Days? Whatever the verdict of history on his expansion of government and particular policy prescriptions, this much is clear: Rather than succumbing to dictatorship or chaos, the United States underwent a "laughing revolution," as a reporter covering FDR put it, the projection of one man's faith in his own performance and in the capacity of democratic institutions to confront the terror of the unknown. That March of 1933, the new president did not have to mobilize aging members of the American Legion under martial law. Franklin Roosevelt mobilized himself and his latent talent for leadership. He found his voice, and his voice defined America. Copyright ©2006 by Jonathan Alter. Reprinted with permission from the publisher.